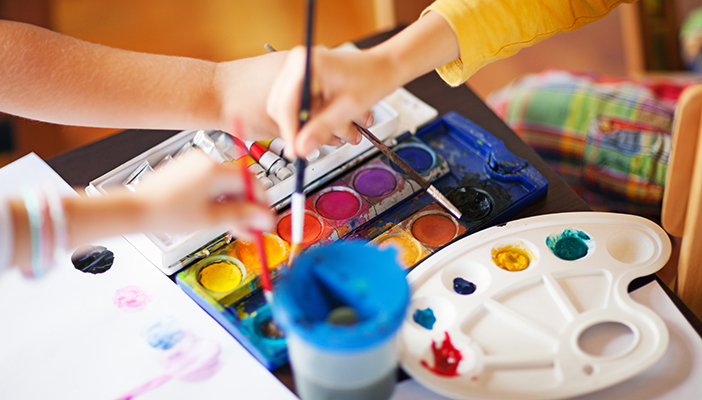 Art teacher Margaret Simpson asks what makes children creative, and what parents and teachers can do to grow their artistic nature. I believe my role as an art teacher is to stimulate awareness and curiosity and to encourage children with vision impairment (VI) to explore the creative possibilities in a range of experiences. Many art educationalists believe that every child is born creative and that this is a basic human instinct. Some believe that the education system, with its set of predetermined outcomes, prohibits spontaneity and creativity. The art education which values the final product over the process of creation may not encourage creative individuals rather than skilled artists or craftsmen. Creativity is related to the thinking process. Most children and young people with VI taking part in artistic activities find the process and the consideration and planning of the process more important than the final piece of art work. As sighted observers we need to respond to the individual art work and appreciate the creative approach as a unique and individual accomplishment. During the early years of child development, it is important to develop the capacity to invent, create, interpret images, make and evaluate. The expressive arts curriculum for early years emphasises the need for exploration as “getting to know experiences” which play an important role in the development of young children. Children with vision impairment have the same right to experience similar creative processes. Creative art can be described as a response to the stimuli in our world and surroundings. In visual terms this can be easily understood, whereas in the case of a child with VI it is often less easy to express his or her response. The child may be deprived of many of the early learning activities associated with sight. They may not have been encouraged to scribble, make marks and use crayons or felt pens to the same extent as their sighted peers. Emphasis on using all the senses - touching, seeing, hearing, smelling and tasting, demands the active participation of the individual. A child that has vision impairment can directly experience only what is within arm’s reach and can be safely touched, and, in most cases, what can be heard. It is not only a question of having sounds to listen to or objects to touch. It is the stimulation of the interaction between the child and the environment that can lead to a child being eager to explore and investigate their environment, rather than retreat defensively from it. Children create with whatever knowledge they happen to have at that time, and allowing them to do so can help them to develop their own insights and understanding. Giving children the opportunity to explore and enquire is the best preparation for future creative action and thinking. This article originally appeared in the May/June 2008 edition of Insight Magazine.